Successfully Added 4GB USB Flash Drive Necklace - Jeweled Metal Heart to your Shopping Cart. All metal heart shaped necklace containing an 4 GB USB flash drive. These days a USB flash drive is as necessary as your house keys. Whether you are taking large work files back and forth from the office or are sharing pictures and music with friends, nothing beats the convenience of a USB storage drive. Well, why not make sure the one you get fits the person who is going to carry it? 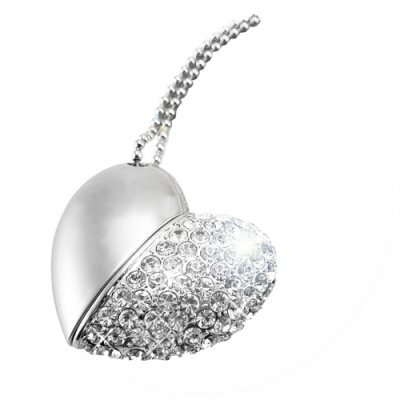 This is an elegant all-metal and jeweled heart necklace that has a built in 4GB's of memory so you or your loved one will have enough space to keep those treasured memories close at heart. This elegant USB flash drive necklace is available right now at a great wholesale prices with no M.O.Q. (no minimum order quantity) from Chinavasion. Order received in just 3 days with DHL .. the flash disk is looking nice & it's made of a metal with chromic side & crystal on the other just as in the picture & maybe better .. It was well packed in a sweet pink box ready for a gift to your GF or others.